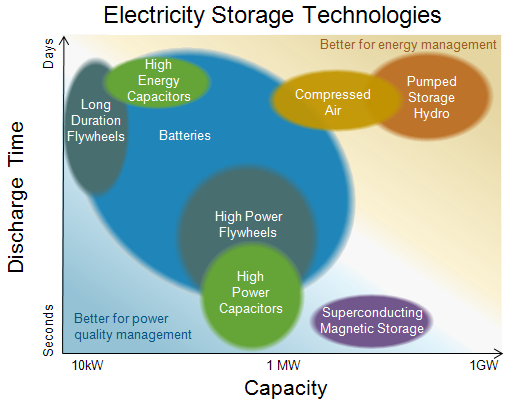 Source: U.S. Energy Information Administration, based on Energy Storage Association. Note: This figure shows approximate representation of each storage type's technological characteristics. Some types, especially "batteries", encompass many technologies within the general shape. Grid-scale energy storage technologies are currently limited in use but may see increased adoption in the future. Currently, the vast majority of existing storage is pumped hydroelectric storage. A wide variety of technologies can serve an array of functions around the electric power system, from assuring power quality to deferring electric power system infrastructure upgrades to integrating variable generation from wind and solar generators. Unlike other commodities, there are not significant stocks or inventories of electricity to cushion differences in supply and demand. Electricity must be produced at the level of demand at any given moment, and demand changes continually. Without stored electricity to call on, electric power system operators must increase or decrease generation to meet the changing demand in order to maintain acceptable levels of power quality and reliability. Electricity markets are structured around this reality. Currently, generating capacity is set aside as reserve capacity every hour of every day to provide a buffer against fluctuations in demand. In that way, if the reserve capacity is needed, it can be dispatched or sent to the grid without delay. There are costs, at times significant, to requiring the availability of generating capacity to provide reserves and regulation of power quality. However, economic storage of electricity could decrease or eliminate the need for generating capacity to fill that role. Various types of existing or potential storage technologies are adapted for different uses. All storage technologies are designed to respond to changes in the demand for electricity, but on varying timescales. Energy management / long timescales. Daily, weekly, and seasonal variations in electricity demand are fairly predictable. Higher-capacity technologies capable of outputting electricity for extended periods of time, such as pumped hydroelectric storage or compressed air energy storage, moderate the extremes of demand over these longer timescales. These technologies aid in energy management, reducing the need for generating capacity as well as the ongoing expenses of operating that capacity. Variations in demand are accompanied by price changes, which lead to arbitrage opportunities, where storage operators can buy power when prices are low and sell when prices are high. Power quality management / shorter timescales. Demand fluctuations on shorter timescales—sub-hourly, from a few minutes down to fractions of a second—require rapidly-responding technologies like flywheels, super-capacitors, or a variety of batteries, which are often of smaller capacity. Responding to these short-timescale fluctuations keeps the voltage and frequency characteristics of the grid's electricity consistent within narrow bounds, providing an expected level of power quality. Power quality is an important attribute of grid electricity, as poor quality electricity—momentary spikes, surges, sags, or outages—can harm electronic devices. Cost is currently one of the major barriers to wider implementation of energy storage technologies. Additionally, the structure of a given electricity market may not assign explicit economic benefits to the functions storage can serve. However, energy storage research is an active field; a recent report from Ernst and Young details significant venture capital investment in energy storage technologies in the third quarter of 2011. Upcoming articles will discuss specific examples of electricity storage technologies functioning on both short and long timescales, and their current applications.